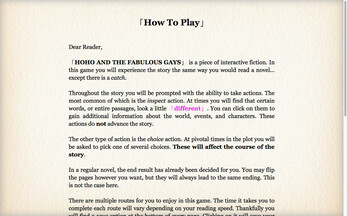 This game is available as to play for FREE in your browser! 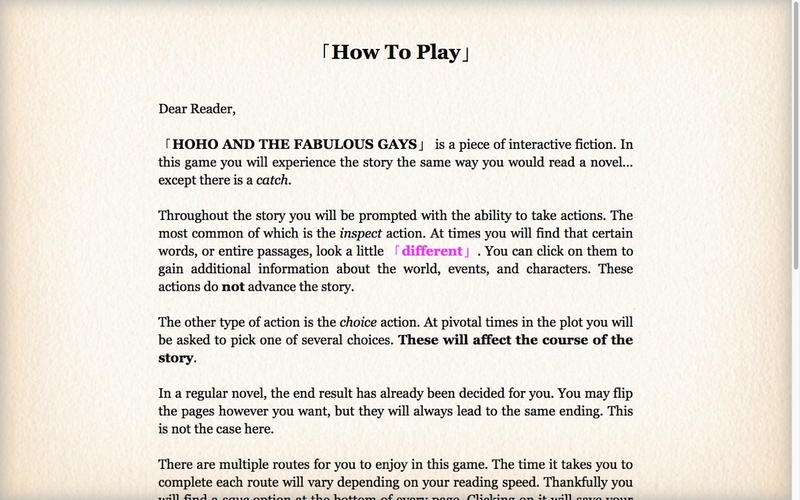 Make sure to click on that lower-right button to make the game full-screen, as well as using your browser's zoom-in and zoom-out shortcuts to increase/decrease the text size. 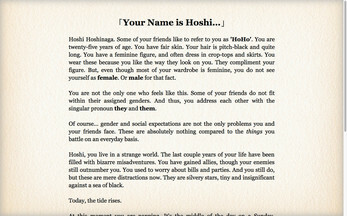 If you would like to, of course, you can also download the game and run it off of your own browser. Please note that images are not available offline. 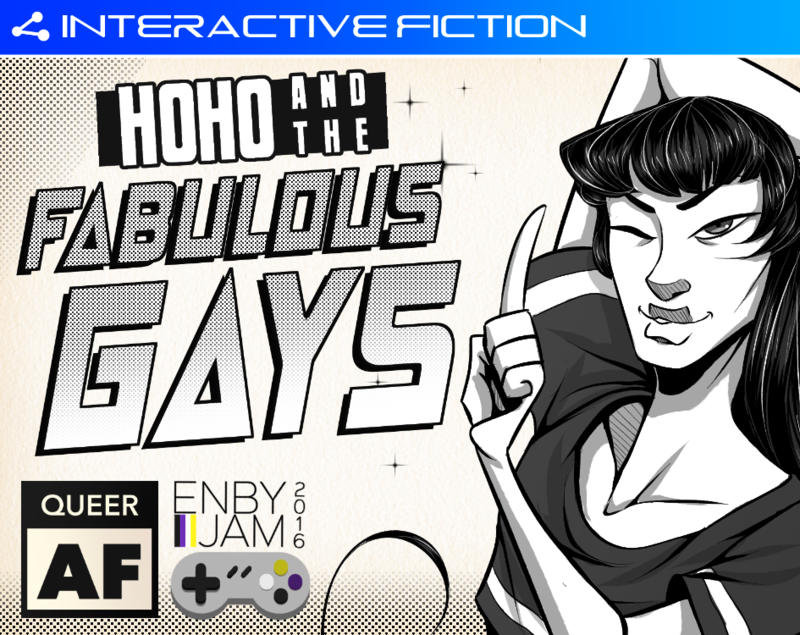 One more thing!「HoHo and the Fabulous Gays」was made as a part of #ENBYJAM. It was written and coded in just three days. 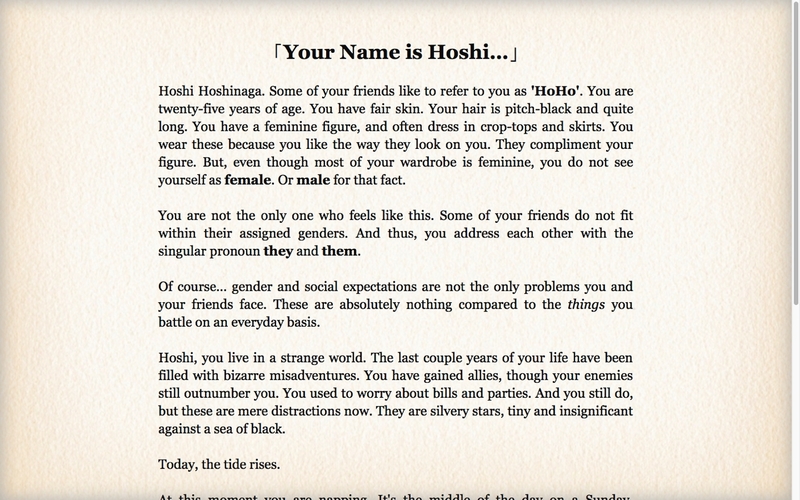 If you would like to learn more, feel free to read the 「ABOUT」page in the game. Have issues downloading the game? Get it HERE! If you enjoy this game, please consider leaving a donation! It would help fund future interactive novels as well as ensure MistreKirin can keep buying the coffee that keeps them writing! I've started a read-through/play-through of this game, and I just want to say that I really love it so far!! You bring a whole new perspective to the shaman/warrior genre, and your characters are very engaging. Not to mention how well you combine gender commentary with your overarching storyline. Here's the link to the first video (the only one up so far), if you'd like to see it. Have a great New Year!